04-Jul-2008 -- This is the 34th of a series of 83 confluence visits during our voyage from Nigeria to Europe and back to Nigeria around the entire African continent. It all started on 28 January at 11N 5E. Story continues from 31N 5W. 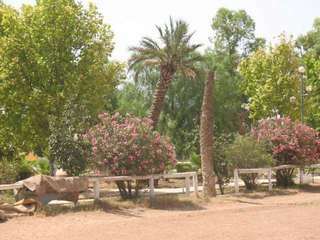 After spending a couple of days in the Moyen Atlas, we were at Azrou where we spent the night at the camping place. We took the national road to Fès. Just before Fès at the suburb of Aïn Amyer, the Confluence can easily be found at the Auberge Ryad al-Faras, at the riding club Equestre. When we arrived, Housain was busy giving some students riding lessons. Housain told us about the organised trips they make on horseback all over the country. After a very nice conversation we continued and meet up with some old friends of ours.